It may seem strange to see a Venues article featuring Egypt in Magazine Americana, which published articles on American popular culture from 1900 to present, yet American pop culture technology has had such an impact on recent events that it seems appropriate to discuss it on these pages. The title of this article might seem hyperbolic as well. It may be. But the effect of social networking tools such as Facebook have, in truth, had a tremendous impact on the social protests against President Mubarak, as well as other despots in North Africa and the Middle East. Ghonim has referred to the recent events as an “internet revolution,” adding “I’ll call it Revolution 2.0.” He argues, “If you want to free a society, just give them internet access. People will see the truth.” AOL writer David Knowles explains: “Ghonim, who used Facebook to organize the initial demonstrations, said the site's power to mobilize masses of people around a single idea is what made such dramatic change possible in his homeland.” Knowles also reports that the cyber activist plans to write a book about his experience with the internet during the uprising and call it The Revolution 2.0. According to Ghonim, “Once you are a fan, whatever we publish gets on your wall, So the government has NO way to block it later. Unless they block Facebook completely.” Egyptian authorities, realizing the impact of the internet – as well as cell phones – did indeed cut off the service. But there were work-arounds and eventually the service was restored. When Ghonim, or Admin 1 for the site, disappeared, Admin 2 had to take over. Admin 2 has asked not to be identified, but Newsweek did get an interview with him: “‘I’m the guy who’s the backup in case something really horrible happens’….Once he realized Ghonim was missing, he notified Google and Ghonim’s family, and then set to work changing passwords and securing things on the Web. ‘I wanted the page to stay alive. The most important thing is the page itself,’ he said. ‘The page is more important than any individual.’ In fact, he worried that by changing the passwords, he could be risking greater harm for Ghonim - what if police were torturing him for access to the site? ‘I either protect my friend or I continue the movement,’ he said, clearly haunted by the dilemma.” Admin 2 secreted a sealed envelope to a friend containing passwords and instructions for working the site. If he went missing for more than a day, the friend was to take over. 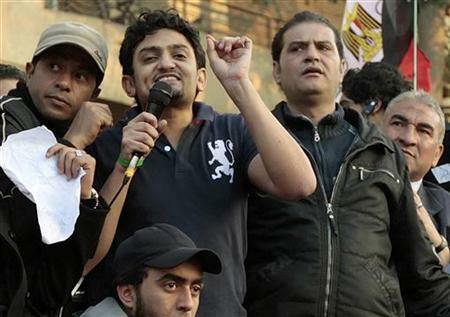 As we now know, Mubarak fell and Ghonim made history with the world’s first internet revolution. The course of an entire nation has been changed with the help of such technology as Facebook. Kidnappings? Secret envelopes? Code names? Sound like the plot to a spy thriller? You bet. But you know what they always say: Truth is stranger than fiction. Many of us rolled our eyes when Time named Mark Zuckerberg Man of the Year in 2010. Now, as we watch the events unfurl in Egypt and other countries in that region, we realize the editorial staff at the magazine could see the eventual impact of Facebook a little more clearly than we could.